That books and style often go together is a relatively unexplored area. 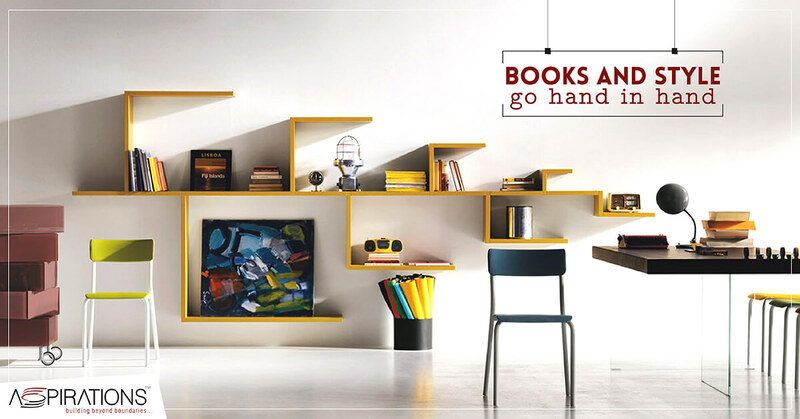 You simply do not need to be a bookworm to get your room look enigmatic with the paraphernalia of books. A minimalistic approach with punchy style is more than enough to make your living with Aspirations best residential projects in Kolkata a dream attainable. Simple is always rejuvenating. Bookshelves are meant for books, so it’s always better not to clutter with other décor accessories unless they add to the sensed Books come in different sizes and colour which can be set in a pattern accordingly. The design need not be in order, however, randomization but maintaining balance can be incorporated for an aesthetic appeal. Accessibility is again one of the primary concern. After you own Aspirations residential complex in Kolkata, the beauty of your room must be enhanced through beneficial use. It is always advisable to keep smaller books in front while stacking the larger ones behind. The other way is to apply the divide and rule policy. Separating the books according to their types, genres or authors is always commendable. If you want your bookshelf to be the aesthetic center of your room, an interesting choice is to colour that particular section of the wall differently. Light colours are appreciably better as backgrounds to already colourful books as the best real estate developers in Kolkata provide you with ample opportunities to relive your bookish dreams. Spaces between bookshelves and their sizes contribute to sensory pleasure. Use multiple shelves of varying spaces between each to spread out your books. Some shelves, when assigned diagonally, look mesmerizing while some in the pattern of the staircase look funky. The choice is based on your preference. Try stacking your books vertically and horizontally side by side to give that disorderly yet elegant look. Never miss out on the subtleties of life with Aspirations best residential projects in Kolkata. Bookshelves are better when left open. Closed bookshelves with glass doors are often prone to reflecting unnecessary light blaring out the book names. The transparency of spaces is an artistic tact while simultaneously adding easy use too vigorous readers. If an entire wall is a mini-library, try replacing books from certain shelves with antiques! Convert your experience with Aspirations best residential projects in Kolkata into a brain-storming session as creating your collection of books is not far away.